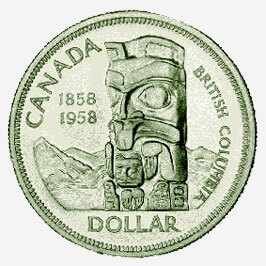 This silver dollar, with its bold design of mountains behind a totem pole typical of Pacific coast Native Canadians, marks the centennial of British Columbia's establishment as a Crown Colony. In the early 1840s what is now British Columbia was part of the Oregon country and was controlled by the Hudson's Bay Company. By a treaty signed in 1846, however, the territory was divided along the 49th parallel. The United States was given title to the southern part of the territory, which had been settled by pioneers from the eastern United States; Britain was ceded all the land above it, including Vancouver Island, which became a Crown Colony in 1849. The colony grew very slowly at first; in 1855 the European population of the island numbered fewer than 800 and the Europeans on the mainland were associated with trading posts. This situation changed almost overnight when, in the spring of 1858, gold was discovered on the Fraser River and thousands of prospectors (mostly from California) flooded the mainland. James Douglas, the Governor of Vancouver Island, acted quickly to protect British sovereignty and in November 1858 the new Crown Colony of British Columbia was proclaimed. The two colonies were amalgamated in 1866. By the late 1860s the gold rush was over and most of the prospectors were gone, but the foundations of Canada's west coast province had been laid and British Columbia joined Confederation in 1871. This coin is part of the Bank of Canada's National Currency Collection.